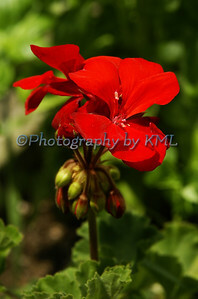 Not completely in bloom, this red geranium is beautifully contrasted against the green leaves. We use them as annuals in the garden, but I remember my Grandmother having one for years as a houseplant. It would sit outside in the summer and winter over in her pantry, where I always found it to be quite chilly. It must have liked it - it was always so healthy looking. I think of my Grandmother when I see them - especially the red ones - it was her favorite color. 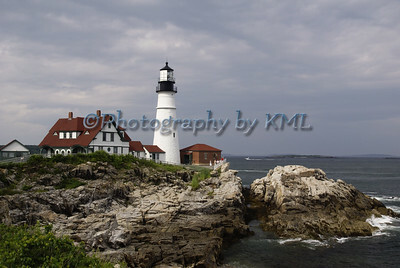 Sharing a photo from the past today - the Portland Head Light in Portland, Maine. We are still without power from Hurricane Irene, so this post is a quick one. My husband, when he was a young man, stood on the rocks overlooking this light house during a big storm. 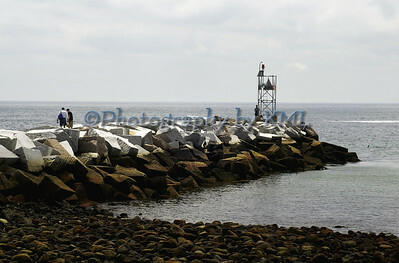 It sits pretty high up on that rocky cliff, but he saw the waves going over the top of it. Mother Nature is surely powerful and amazing! 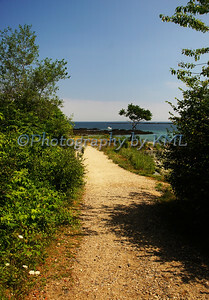 Rye Harbor has the reputation of being the seacoast town that is hardest hit when bad weather comes to NH's small coastline. Even though it is protected by this breaker wall - one on either side of the harbor, all the boats are being taken in from the docks and the moorings. There are times, not during a hurricane, I have seen waves flying over the top of this wall. I can just image what it will look like this weekend when Hurricane Irene comes calling. We are well inland - an hour away from the coast, but the eye is expected to pass even further west then us. We are preparing the best we can, and hoping that all in her path remain safe. There hasn't been anything like this in our area since 1938. Keeping positive as we await her visit. One of the the first things that come to mind when a disaster strikes a home is the safety of all those in it. Knowing that everyone is safe, the next thing that comes to mind is what is the most important material thing in it. Most people will rush to the family photo albums - they are irreplaceable and must be saved. These days, most us have our family photos stored on our computers. And very seldom does anyone think of doing a computer backup up of these precious memories. But if the computer gets compromised in any way, such as hard drive failure, virus infection, or even stolen, there go many of the files on it, either destroyed, corrupted, or deleted forever. Carbonite, a company that provides online backup for PCs and Macs can help keep those photos and other document files safe. They offer unlimited back up and it works automatically in the background each time the computer is connected to the internet. Secure, unlimited, and automatic back-up is only $59 for a year, and if you use the code: BLOGAD, you get two months free with your purchase. Once the files are online, you can access them from any internet device - a computer, iPhone, iPad, or Smartphone. Keeping photos safe is often overlooked. Online backup can keep them safe for the future generations. 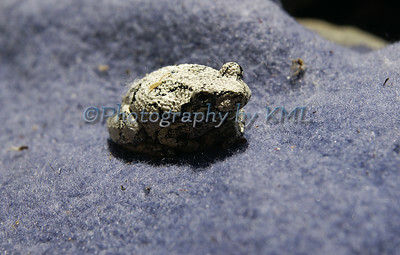 Not quite sure where this little guy came from, but we found him on a rock beside the driveway. He hopped onto some mats we were cleaning and stayed there long enough for me to photograph him. He is white, or a very very light gray with black markings on his back. It's the first time I have seen a frog with his coloring. We have lots of the brown and green ones around. Haven't seen him since but I do keep my eye peeled for him around those rocks. The tide was low when we arrived. So we took a walk and ate lunch as we watched it come in. By the time we were in that ocean water, the tide was close to high - covering the rocks and seaweed. Swimming in the ocean in our wetsuits was all I hoped it was going to be. We snorkeled around the rocks, but it was so hard to get "under" the water as the wetsuit made us extra buoyant. That wetsuit is something else - you feel the water creeping in from the bottom up, and it is some chilly. But once it is in there, it warms up to your body temp and you don't feel the water outside. And when you leave the water, you feel it creep down as it drains out. I will say, it was a hot, humid day, and putting that wetsuit on was a trip and a half. Skin tight is not the word for it, and it doesn't slide on. It protests with every pull. Once on, getting in the water quickly is important before you pass out from heat exertion. I am so anxious for our next ocean swim - I really loved it. Tomorrow we are planning a trip to the ocean - my most favorite place to be. 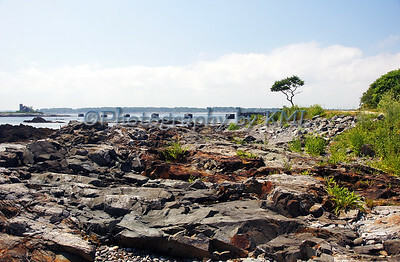 The beach, rocks, cliffs, bluffs, marshes - I love it all. But tomorrow is going to be different for us. We are going on an adventure. If you have read any of my other blogs, then you know we go swimming at the lake everyday. Tomorrow we conquer the cold ocean - in wetsuits! I have never tried one, but we purchased some for using in the lake when it gets colder. I haven't been fully in the ocean since I was a young girl. We're going to a beach with gentle waves without a rip tide. Can't wait! It was just a few minutes after we started swimming in the cold lake water. A first year eagle started flying above us. Swooping and gliding, he circled on the wind currents, his sharp eyes on the look-out for his dinner. He continued until we reached the half way point in our swim, then he took off for home, unsuccessful in his fishing. We finished our swim, keeping an eye on the sky. Leaving the water and running for our warm towels, we caught him just above us again. So back into the lake we went - man that water was so warm now. We watched for another fifteen minutes until he headed for home, unsuccessful again. He was a joy to watch, but unless mama eagle is still around to help him out, he will have an empty belly tonight. 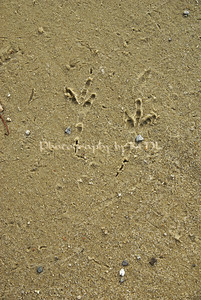 The prints above are not his, but a set from another of the many birds that make the lake their home. He posed just right for me. 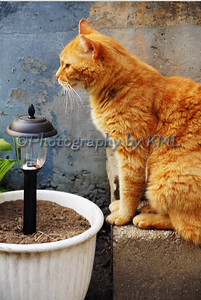 Sitting on the step overlooking the solar light, he sat there just long enough for me to grab this shot. That pot now has a beautiful patch of basil growing in it. It's so tall the light has been fully engulfed. There's no way Rusty would sit next to it now like this. That basil smell is just not to his liking. But if it were catnip, I bet I wouldn't be able to keep him out of it! The pretty daffodil blooms had passed, and the green leaves were all that remained. Knowing that they must turn brown and dry up before they are removed from the garden we let them lay until about mid May. Then they get braided - many patches of them fill the flower bed. The summer flowers grow around them, covering the braids that are beginning to turn brown. All the life and goodness of the flower has returned to the bulb under the ground - ensuring it will grow next spring. 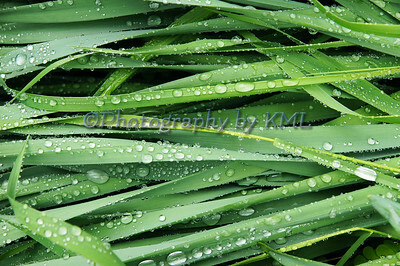 I love the way the water beads up on the leaves after a rainstorm. He made it through the winter. And this is how he has been spending most of his summer. 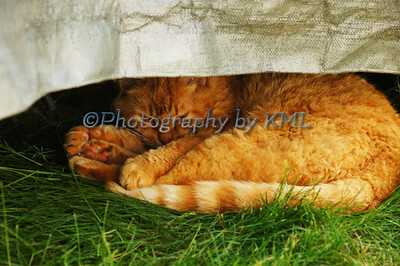 Under the shade of a tarp with the green grass to keep his underside cool. When the sun heats up the porch, we will find him here, just a couple of feet away from the porch steps. He has thinned out quite a bit this season. This feral cat has been around for about ten years now. We has gotten quite frail lately so we are already worrying about the winter again. We will continue to help our Rusty as long as he lets us. I could hear the ghosts as we passed by. The damp cool air coming from that dark place made the hair rise on our arms. As the sign states, it was built and used in the year 1808. 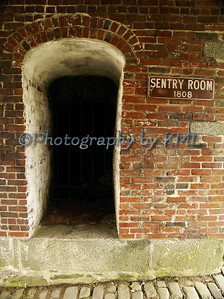 It is part of the old fort system that runs along the New England seacoast of the US. We didn't go in even though the barred door was open - beckoning all who dared. I just left those ghosts to themselves.